For the graphics standard, see Video Graphics Array. The same VGA cable can be used with a variety of supported VGA resolutions, ranging from 320×400px @70 Hz / 320x480px @60 Hz (12.6 MHz of signal bandwidth) to 1280×1024px (SXGA) @85 Hz (160 MHz) and up to 2048×1536px (QXGA) @85 Hz (388 MHz). There are no standards defining the quality required for each resolution but higher-quality cables typically contain coaxial wiring and insulation that make them thicker. Shorter VGA cables are less likely to introduce significant signal degradation. A good-quality cable should not suffer from signal crosstalk, whereby signals in one wire induce unwanted currents in adjacent wires, or ghosting. Ghosting occurs when impedance mismatches, 75Ohm by the specification, cause signals to be reflected. However, ghosting with long cables may be caused by equipment with incorrect signal termination or by passive cable splitters rather than the cables themselves. 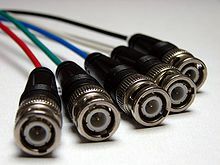 Some high-end monitors and video cards featured 5 separate BNC connectors for RGBHV signals, allowing highest quality connection using five 75 ohm coaxial cables. Within a 15-pin connector, the red, green, and blue signals (pins 1, 2, 3) cannot be shielded from each other, so crosstalk is possible within the 15-pin interconnect. BNC prevents crosstalk by maintaining full coaxial shielding through the circular connectors, but the connectors are very large and bulky. 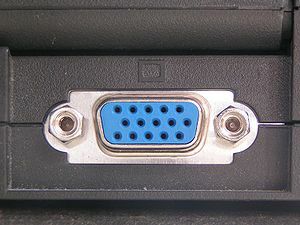 The requirement to press and turn the plug shell to disconnect requires access space around each connector to allow grasping of each BNC plug shell. Supplementary signals such as DDC are typically not supported with BNC. ^ "Color Monitor Multisync XL". elektrotanya.com. Retrieved 24 February 2017. ^ "The Nexus: Projects - VGA to SCART Converter". Nexusuk.org. 2013-06-26. Retrieved 2013-10-21. ^ "VGA to TV converter page". Epanorama.net. Retrieved 2013-10-21.